The Koolpak ® Instant Ice Pack is a multi-purpose instant cold therapy pack that provide instant relief for pain caused by sprains, strains, bumps and bruises to the Knee and ankle. Great instant ice packs, especially for children. Compact size so easy to take a few to events/ competitions and suited to children's smaller size but ok for adults' minor.injuries too.. Easy to activate. Good price. This is my second order for these very good when you are out and about. I go mountain biking so no fridges. Ready in 2 or 3 seconds. Always have two or three in the car. Easy to use and really handy for instant cooling. Not as cold as a freezer block but it just meant I found I could put them straight on to my skin without wrapping and that worked very well (suggest to test it our first!). Why wouldn't you have a few of these in your kit bag? Great product Ideal size to keep in sports bag in time of need ... My Son is a goalkeeper and is always knocking his fingers so wraps around the hand easily! Bought these last minute to take on the plane & to use on my holiday in Bali. I was recovering from a broken ankle and needed to ensure my ankle was kept cool with ice packs to avoid chronic swelling, especially at high altitude. These Ice packs worked wonders; an absolute life saver. Easy to use and cool as a cucumber. Lasts about 20-30 minutes and are a decent size to cover most areas prone to injury. Excellent price too! Great price for a good product. Unfortunately they are heavy which bumps the costs up but still reasonable value for the product. We use vast quantities of these at Hackney RFC and they are excellent. Easy to use, long lasting and very flexible. We use them with the junior and senior teams. The temperature is cold but not freezing and so can be used on children without a priblem. My team have just gone into the Under 15s and I thought I would buy some additional ice pack for the new season. Good job I did. I used four in the same friendly game pre-season and have used more since in training. These are such good value though that it doesn't matter that I am using them up at a faster rate than before. I will definitely be ordering more shortly! these ice packs are great, I order then for our local rugby club and its good to know they are always available and also great for putting in the kit bag for away games. Kool pak Instant Ice Packs are the best on the market, they stay colder for longer than other brands, Newitts are always on time with deliveries and always a reasonable price. 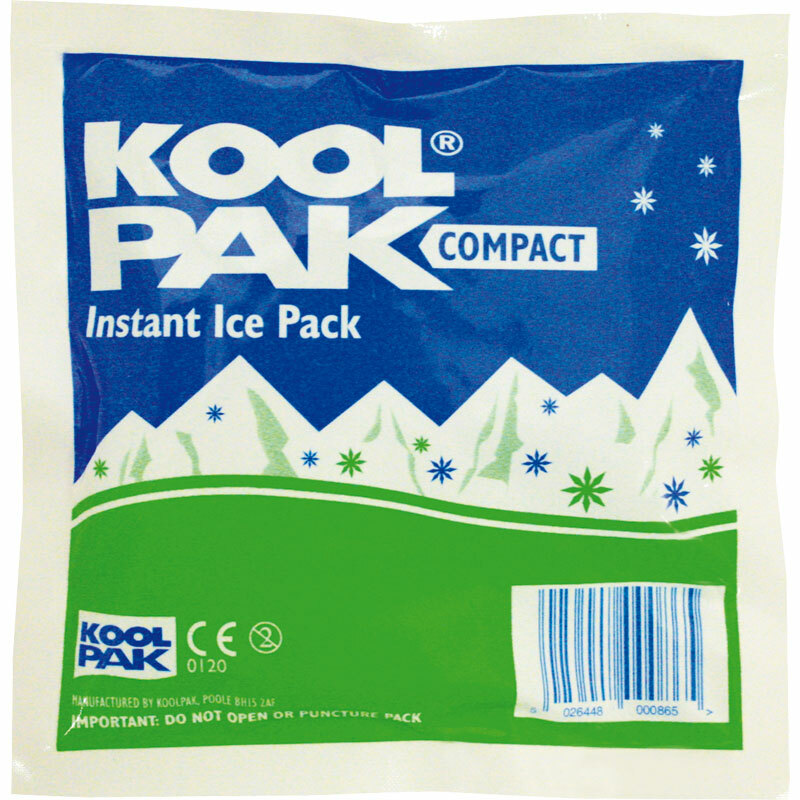 Koolpak Instant Ice Packs / cold compress stay colder for longer than other brands, as a longtime first aider i would recommend this product, Newitts always deliver quickly and on time and there products are always reasonably priced. Great combo! This is a great product as it works so simply and quickly and the packaging has an extra piece of plastic which folds over to put next to the skin to prevent burns. Need to store them in a first aid box or similar to stop them being crushed in a bag causing the chemical reaction to take place. Good value for money! Koolpak Instant Ice Packs last longer than other instant ice packs my company have tried, Newitts price is very reasonable and delivery was very quick. I ordered 60 Koolpaks for my daughters knee problem - she has tendonitis and we were going away without access to a freezer at all times, so needed instant icepacks. Not as cold as the re-usable ones, and don't last as long, but it did help to keep down the swelling. stop collaborate and listen, koolpak is back with a brand new addition. great ice pack stays cold longer than others, and always prompt delivery by newitts. Newitts supplied as they promised. Thankfully I have only used one so far but I had an awful job trying to make the inner bag burst, and old person would not be able to use them very easily. Used these after my wife's knee operation in hospital. They worked perfectly although sometimes my wife had difficulty squeezing the bag to burst the inner bag. A slightly larger size may have been better. Excellent product at an excellent price. Fine product. Essential part of the cricket clubs first aid equipment. Does what is says on the pack. Good price through Newitts. This is a great product, it is easy to use and I would recommend it. It is a clean and dry way to cool injuries. Excellent product, great for dealing with those little knocks during a kids football match. Easy to fit a couple into a first aid pack and quick and easy to use bringing instant relief. Very quick delivery, issue with damage upon delivery, friendly support woman sorted immediately and resent damaged item back out. Product is very good. Have used them in the past but touch wood didn't need any on this month Guide Camp. Very handy to have instant ice pack wherever you go. Buying Koolpack Instant ice pack from Newitts, was a very smooth transaction and the Ice packs are second to none! Koolpack - great no problem with product. Unfortunately though a number (5) across the boxes we purchased had been "popped" already before being delivered to us. Great product works well and does the job,purchased for my two boys who both do high impact sports great value for money going to purchase again. These are a great product and work really well. The price of them is super and I haven't managed to find anywhere else cheaper. The only thing you have to be careful of is that they aren't squeezed in the first aid kit by accident otherwise it doesn't work!